^ "Interpol plea on missing president". BBC News. 2018-10-06. Retrieved 2018-10-06. 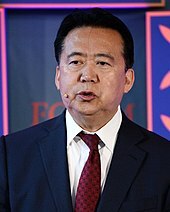 ^ "French police launch investigation after Interpol chief goes missing for a week in China". The Independent. Retrieved 2018-10-06. ^ "Detained Interpol chief 'took bribes'". BBC News. 2018-10-08. Retrieved 2018-11-26. ^ "N2018-139 / 2018 / News / News and media / Internet / Home - INTERPOL". www.interpol.int. Retrieved 2018-11-26. ^ "Russia loses Interpol presidency vote". BBC News. 2018-11-21. Retrieved 2018-11-26. ^ Ravid, Barak (2017-09-27). "Interpol Votes to Accept 'State of Palestine' as Member Country". Haaretz. Retrieved 2017-09-27. ^ "Interpol foundation shows HSBC boss the door". swissinfo.ch. Swissinfo. February 24, 2015. Retrieved March 22, 2018. ^ Matt Apuzzo (2019-03-22). "How Strongmen Turned Interpol Into Their Personal Weapon". The New York Times. Retrieved 2019-03-23. ^ "INTERPOL reinstates alert against Russian refugee". FairTrials.org. Archived from the original on 2013-12-11. ^ "S.2426 – A bill to direct the Secretary of State to develop a strategy to obtain observer status for Taiwan in the International Criminal Police Organization, and for other purposes". 2016-03-18. ^ "Ex-Ukrainian president Yanukovych no longer on Interpol wanted list". uatoday.tv. Archived from the original on 2015-07-22. ^ "Likely next Interpol chief Prokopchuk 'fox in the henhouse', US senators say". BBC. 2018-11-20. Retrieved 2018-11-20. ^ "NGO, human rights groups from different countries oppose election of Russia's representative as president of INTERPOL". Interfax. 2018-11-19. Retrieved 2018-11-20.